The PR-80 is a unique video display and performance system designed for video display or visual performances used in retail, concerts, churches, tradeshows, hotels, conventions centers and seminars. The internal hard-drive storage format is DV so display quality remains very high – ideal for plasma and large display applications. Playback of clips is instant and can be configured in preset sequences. Real-time presentations can be triggered on demand using a touchscreen, RS-232C device, MIDI controller, optional DV-7C controller, mouse or keyboard. The PR-80 is capable of streaming two high quality DV streams simultaneously that can be mixed internally without the need for an additional mixing unit. For ad display installations, the PR-80 contains a Scheduler for display management and is also networkable sharing content folders and clock adjustments remotely. Multiple PR-80s can be setup in a master/slave configuration for synchronized multiscreen applications. In addition, it can be turned into a stand-alone KIOSK via its customizable GUI. 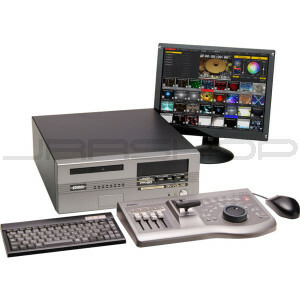 The PR-80 also includes the full functionality of our DV-7DL Pro Direct Linear Editing system. The editing functions included with the PR-80 presenter allow one unit to both create and present content as well as make critical, last-minute changes to presentation content at a venue or event. Play back high-quality video in Real Time:Play back and switch high-quality DV-format video images in real time. A variety of Realtime Effects:Up to 4 types of realtime video effects like mirroring, colorize, posterise, etc... can be used simultaneously. Includes switching effects for smooth transitions between video images, control of playback speed, resetting of retrigger points, and more. V-LINK Connection:Use the V-LINK function to exhibit video during musical performances, create virtual clips of live video sources with the V-4 (video mixer) control, use the Presenter Control for simple and easy coordination of multiple PR-80s and more. A variety of External Control Functions:Not only can you use the keyboard and mouse, you can use the RS-232C port, optional touch screen, or use the optional DV-7DL Controller, and more. In addition, import and export DV clips and user-define masks via LAN. Dual-stream Playback:Play back two pieces of video at the same time - cross dissolve, mix or even key one over the other (luminance and chroma keys are supported). Automatic Operations with the Scheduler:Use the Scheduler to have the PR-80 automatically perform a variety of functions, such as playing back data, stopping, synchronizing times over a network, or starting up at a predetermined time. 8 types of Preset Masks - also user-definable.